Today is May Day. In many countries, May Day is celebrated as International Workers’ Day, or Labor Day. It is a day of political demonstrations and celebrations organised to commemorate the fight for the eight-hour workday. May First was selected to commemorate the people involved in the 1886 Haymarket affair right here in Chicago. And while America celebrates a Labor Day of its own — established as a federal holiday in 1894 under President Grover Cleveland — the date of May First was intentionally avoided. Instead Cleveland selected the first Monday of September. As such, Labor Day’s American celebrations are more low-key than the May First celebrations elsewhere around the world. I remember Labor Day as the end of summer — picnics, barbeques and the weekend the swimming pools closed. I’m not going to even pretend to provide a summary of all of the social, political, and economic elements at play surrounding May Day other than to highlight that May Day has become an international celebration of the social and economic achievements of the labor movement and the date is inextricably linked to local, deadly actions taken in Chicago 125 years ago. I encourage anyone interested in learning about the history of socialism, capitalism, anarchism, and organized labor to read about the 1886 Haymarket affair. To honor the 125th anniversary, a full-scale reenactment was staged on the original site — a site less than a mile and a half from my home. Groups from all across the city came together to remind people of past labor struggles here in Chicago, and the need to work together in the present. 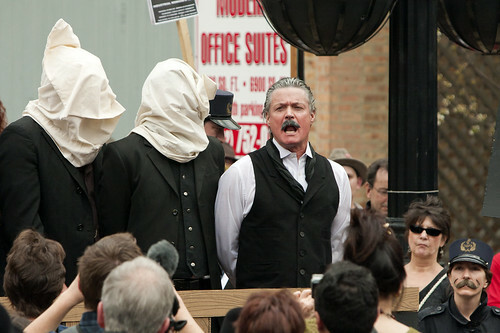 The contemporary battles over collective bargaining in Madison, Wisconsin, Toronto and Iran cast long shadows over yesterday’s reenactment of the deadly Chicago events. Whirl and I attended the reenactment. I took photographs. We listened to the various speeches and toured the site. It was a powerful reminder to me about the awesome position of privilege currently held by contemporary American society and the heavy prices paid by those who came before us, that we might enjoy them. And while I disagreed with some of the more scathing polemic deployed by and against the labor movement, I know that the lessons are there to be learned and not ignored. I do not think in the course of human events 125 years is a particularly long time. Yet the changes seen in the day-to-day lives of people as a result of these sorts of actions are widespread, powerful and oftentimes silently assumed. We would be wiser were we to remember that.